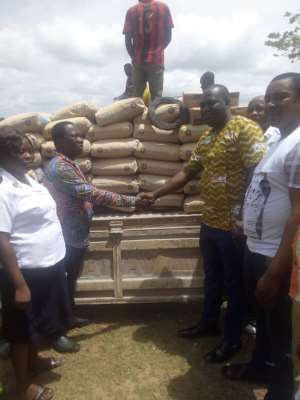 The District Chief Executive (DCE) for Asene Manso Akroso, Mr. Alex Incoom has presented bags of cement, iron rods and other building materials to the Asene Salvation Army Primary School for the commencement of work on a 2-Unit Kindergarten (KG) block with office and a storeroom. The initiative was to encourage the communities in the district to undertake their own projects while the Assembly provide them with the needed technical and material support. The DCE following his tour to educational facilities to access infrastructure deficits in September last year observed the deplorable wooden structure that was accommodating the KGs of the school and promised to assist with the community self-help initiative to construct a befitting KG block to replace the deplorable structure. In a message before the presentation, Mr. Incoom charged the Parent Teacher Association (PTA) and other stakeholders in education to support the Akufo-Addo educational policies to accelerate the transformation of the economy for the long term vision of building a Ghana Beyond Aid. Mr. Incoom encouraged the public to revive the spirit of community self-help in undertaken their own projects while the Assembly support them with the needed technical and material support. According to him the time is due for people to show interest in the development of their own communities by undertaking self-help projects to complement the efforts of government. Receiving the items on behalf of the school, the Headteacher Mr. Emmanuel Osei thanked the government of Akufo-Addo for the unalloyed commitment of making education free from Kindergarten level to pre-tertiary level. He bemoaned the continue resistance of parents to support the school in terms of difficulty and hoped that the pupils will pass whatever message they have had from the DCE today to their parents to encourage them to have a change of mind. Mr. Osei appealed to the Assembly and the Member of Parliament in the Area Mr. George Kwame Aboagye popularly known as “Oluwa” to assist in catering for the labour cost of works on the construction of the KG block. The DCE was accompanied by Mr. Antwi Boasiko of the Works Sub-Committee of the Assembly and some district Assembly’s staff.